Dry shade presents a special challenge for gardeners, because so many shade plants prefer moist soil. My own shade garden (shown below) is dry because it’s under a grove of evergreens, but it was only shade I had to work with. It’s a common myth that nothing will grow under pine or spruce trees because dropped needles turn the soil acidic. But as you can see, perennials can thrive in these conditions. In fact, the big reason many plants don’t thrive under evergreens is extreme dryness. The cure: watering twice as much as you would a normal garden bed, and layering a few inches mulch over the soil. To let more light into your shade garden, consider limbing trees up by cutting off some of the bottom branches. Selective pruning to let in more light works with deciduous trees, pine trees or thin older spruces, but don’t do this if your evergreen is a perfect Christmas tree shape with branches down to ground level. Instead, mulch under the tree rather than disfigure it for the sake of a few impatiens or hostas underneath. You’re most likely to find dry shade under trees with shallow spreading roots, such as Norway maple, beech, willow, and evergreen trees. To give your plants the best possible chance under such conditions, water them regularly and fertilize more often than you normally would. The following plants will perk up a dry, shady spot in your garden – which is not to say that they prefer dryness, just that they’ll do better in dryer conditions than other shade plants. Be sure to water them well in the first couple of months while they’re getting established. Barren strawberry (Waldsteinia): A low-growing, dense mat of leaves that slightly resemble those of strawberries. Big-root geranium (Geranium macrorrhizum): Attractive and aromatic leaves, flowers in late spring in colors ranging from white to pink and magenta, depending on cultivar. Not to be confused with the common annual geraniums (Pelargonium). Bishop’s hat, or barrenwort (Epimedium x versicolor): Attractive heart-shaped leaves. With its delicate yellow flowers, ‘Sulphureum’ is the most popular cultivar. Dead nettle (Lamium maculatum): Look for cultivars such as ‘Beacon Silver’ with rosy pink flowers and silver leaves edged in green or the white-blooming ‘White Nancy’. Heart-leaved bergenia (Bergenia cordifolia): Large, leathery leaves and rose-pink flowers in early spring—looks great in a big grouping. 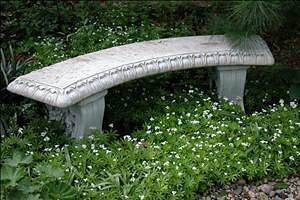 Sweet woodruff (Gallium odoratum): Finely textured leaves and white flowers in spring—top-flight ground cover in the shade garden. Will spread. 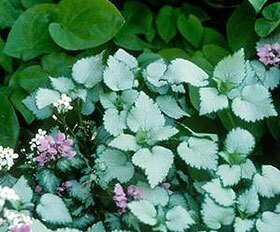 Ground cover plants: To make dry shade gardening really easy, consider the big three ground covers – ivy, pachysandra, and periwinkle – which are all tough evergreen perennial plants, perfect for the shade garden. See also perennial ground cover plants and how to use them effectively in your garden.